From anime girls to abstract shapes, Japanese tattooing has changed. Or has it? Throughout my book Japanese Tattoos, a wide variety of classic motifs are presented. Some of them are well over a thousand years old, while others are much newer. Japan’s visual vocabulary is not static. Irezumi (Japanese for tattoos) aren’t, either. They’re as alive as the skin on which they breathe. Below is an excerpt from said book, which I co-authored with Osaka-based tattooer and otaku clothing designer Hori Benny. Much of it covers traditional motifs like koi, cherry blossoms, and dragons, etc., but here’s where we geeked out. This piece originally appeared 7/11/16. Part of what made irezumi intimidating in years past was that you couldn’t walk off the street right into a tattoo parlor. They were hidden in houses, apartments, and unmarked buildings. That changed in the 1990s with the advent of the “street shop” in Japan. Complete with signs and listed phone numbers, these were walk-in tattoo parlors like those found throughout much of the Western world. Instead of the back-room studios closely associated with organized crime, these shops provided a far more inviting environment designed to break the intimidating stereotype. Sabado’s street shop in Nagoya, Japan. Many of the new generation of tattoo artists eschewed the traditional apprenticeship, picking up their craft elsewhere or even teaching themselves. The self-taught Japanese tattooer known as Sabado opened Eccentric Tattoo Shop in Nagoya in 1993, among the first—if not the first—of Japan’s street shops. “For the year before that, I tattooed out of an apartment, but I wanted to make a shop like I had seen during my travels in the United States and South America,” Sabado explains. It wasn’t only studios that were emerging from the underground. Japanese pop princesses like Ayumi Hamasaki and Namie Amuro also played against type, flaunting their Western-style tattoos in public—something that would’ve been unthinkable for the previous generation of cute celebs. It was an era in which people did the unexpected, whether that was fashion or art, and the nation’s youth once again started getting tattooed. In Japan, they’re now called otatoo (ヲタトゥーor “wotatou”), a word that combines “otaku,” meaning geek or nerd, and “tattoos.” (It’s also a word that was coined by this book’s coauthor, Hori Benny.) These tattoos, which feature characters and designs from manga, anime, and video games, are aimed at otaku and done by otaku. For decades, characters like Mickey Mouse were prime tattoo fodder in the West. Japan, however, had firmly established ideas of how tattoos should look. It wasn’t until the 1980s that American tattooist Mike Malone, who was a colleague of Don Ed Hardy and a protégé of Sailor Jerry, did an enormous irezumi backpiece, but instead of a deity or a Suikoden hero, he inked Godzilla as the subject. This fusion inspired other American tattooers like Dave Waugh to do large anime-themed backpieces. In Japan, the home of anime and manga, tattooers would later follow suit. Around the turn of the century, Hori Hiderow, a tattooist in Hiroshima, was unabashedly incorporating Japanese otaku in influences into his work. At that time, Hori Hiderow’s shop was unlike anything you’d see in Japan: Gundam models, Star Wars toys, and Ultraman figures dotted the studio. Posters of anime girls covered the walls. The place looked more like otaku heaven than a tattoo studio. His work also proudly displayed those geek motifs in a way others in Japan weren’t yet doing. 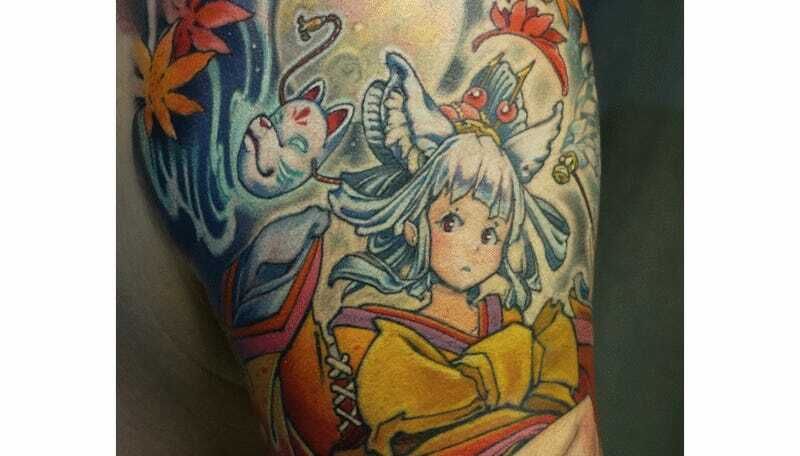 Hori Hiderow, who passed away in 2009, showed a generation of younger tattooers that it was okay to reference (heck, even wallow in) the manga, anime, and video games they loved. In short, geeks could be themselves. “I’ve always loved anime,” says 26-year-old Ayane. “I thought, if I’m going to get tattoos, I’d like to get anime characters.” Ayane is a regular on the Osaka otaku scene, hanging out in the city’s anime, manga, and gaming district of Nipponbashi and often participating in comic conventions. With all her otaku cred, it’s no wonder that both of Ayane’s thighs are covered with stylized versions of the characters Asuka Langley and Rei Ayanami from the sci-fi anime Neon Genesis Evangelion. While Raijin and Fujin are traditional irezumi designs, Asuka and Rei are more contemporary motifs. Tattoo enthusiasts in Japan have always gotten images that speak directly to them. During the Edo period, that was the Suikoden heroes or religious deities. Today, it could be a character from anime, manga, or a video game. These are the modern Japanese myths that offer courage, inspiration, and ideals. And naturally, that makes them perfect for tattoos.